When it comes to superheroic alter egos, Billy Batson may have the most confusing real-world history of any comic book character in existence. Originally created as Captain Thunder for 1940’s Thrill Comics #1, his origin story was reworked and he was renamed Captain Marvel for Whiz Comics #2, later that same year. For a time Captain Marvel was the most popular superhero in America, until the declining popularity of superheroes and a copyright infringement suit from the owners of Superman led to Fawcett Comics ceasing publication of Billy’s adventures in 1953. Despite this, Captain Marvel still had a major influence on American culture, inspiring both Gomer Pyle’s catchphrase and Elvis Presley’s stage costumes. Marvel Comics would later acquire the rights to the name of Captain Marvel in 1967 and DC Comics would license the Captain Marvel characters at about the same time. For the better part of four decades, DC Comics published the comic book adventures of Captain Marvel but was forbidden from using the title Captain Marvel, with all the comics of the time sporting titles like The Power of Shazam! This led to an entire generation of casual readers growing up thinking that Captain Marvel was called Shazam, even though that was the name of the wizard who gave Billy Batson his magical powers – not Billy’s code name. 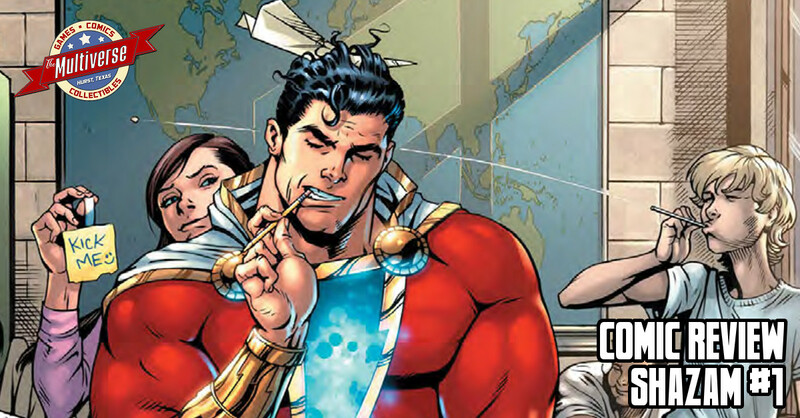 In 2011, DC Comics decided to embrace the popular misconception, and created a new origin for Billy Batson as part of their New 52 revamp of the DC Comics line. The new origin changed very little of the key details, beyond modernizing Billy Batson’s background to reflect the modern reality of foster homes over orphanages and a more involved history regarding the magicians of the DC Universe. Apart from that the story was exactly the same. Billy Batson was a good-hearted orphan, chosen by a wizard to inherit a measure of his power and use it to fight evil and protect the innocent. Thankfully, new readers do not need to know any of this going into Shazam #1 and I mention it only so as to educate you dear readers so as to prevent the confusion that is likely to erupt in early 2019 regarding both Captain Marvel movies. Everything you need to know is explained within the first three pages of this book, along with the events of the original Shazam mini-series, which inspired the upcoming film. That would seem to make this comic series a sequel to the movie that isn’t out yet but new readers shouldn’t have any trouble regardless. There’s two stories within this issue, both written by Geoff Johns, who organized the original Shazam reboot. The first story reintroduces us to Billy and his foster family and sets up two big mysteries for the series to explore. The second is a more personal tale focused on Mary, the oldest of Billy’s new siblings, and how she came to enter the foster care system and form a family with the rest of the kids in their foster home. Both stories are engaging and Johns proves to have a real gift for writing child characters who act like real kids. (i.e. arguing only seconds after seemingly getting along just fine.) The artwork for this issue is as great as the story. Dale Eaglesham handles the first story with colorist Mike Atiyeh, presenting a heroic style that still allows for fluid slapstick and comedic expressions along with classic superheroic action. Those who are familiar with Eaglesham’s previous work on Villains United, Green Lantern and JSA will find themselves in familiar territory. The second story features artwork by Mayo “Sen” Naito and sports a shojo manga style well suited to Mary’s story. I dare say that should DC Comics decide to take another stab at producing original manga again, they would do well to have Naito illustrate a solo series devoted to Mary’s adventures as a superhero. The Bottom Line? Whether you’re a fan of the classic Captain Marvel, know Billy Batson as Shazam, or are a total newbie when it comes to the magically empowered superheroes of the DC Comics universe, this first issue of the new Shazam series will get you up to speed. It’s a darn fine book and family friendly to boot, though younger kids may need help with some of the bigger words. Still, whatever your age, this is one magical read! 10/10 Shazam #1 releases on December 5, 2018!